Andy Warhol: Since you know all these cases, did you ever figure out why people really murder? It’s always bothered me. Why. Alfred Hitchcock: Well I’ll tell you. Years ago, it was economic, really. Especially in England. First of all, divorce was very hard to get, and it cost a lot of money. Andy Warhol: But what about a mass murderer. Alfred Hitchcock: Well, they are psychotics, you see. They’re absolutely psychotic. They’re very often impotent. As I showed in “Frenzy.” The man was completely impotent until he murdered and that’s how he got his kicks. But today of course, with the Age of the Revolver, as one might call it, I think there is more use of guns in the home than there is in the streets. You know? And men lose their heads? Andy Warhol: Well I was shot by a gun, and it just seems like a movie. I can’t see it as being anything real. The whole thing is still like a movie to me. It happened to me, but it’s like watching TV. If you’re watching TV, it’s the same thing as having it done to yourself. 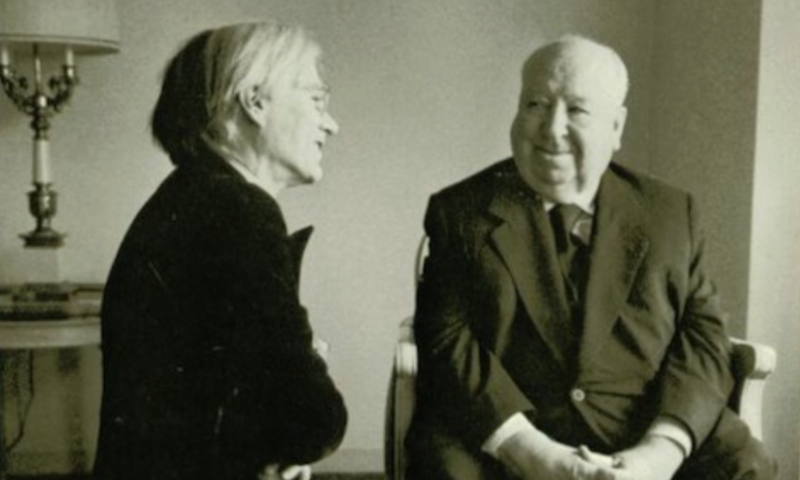 "Warhol openly proclaimed that he was nervous upon meeting the legendary director," adds Filmmaker IQ, "and posed with Hitchcock by kneeling at his feet," resulting in the photo you see at the top of the post. They also include three portraits Warhol made of Hitchcock, the best known of which Christie's Auction House describes as "a variation on the doubled self-image that Hitchcock played with in his title sequence, layering his own expressive line-drawing over the director’s silhouette, suggesting the mischievous defacement of graffiti as much as the canonization of a hero through the timelessness of the inscribed profile." These images and the brief interview excerpt leave us wondering: can one call a work — on film, in a frame, in a magazine — both Hitchcockian and Warholian? A question, perhaps, best left to the theorists.